The Golden Thread appears to have been a great success. It sold out, so to speak, with audience members queuing for over an hour to get in and those that couldn't hopped on to the livestream to view it there. Since then, MIAMAI's BlackLabel Golden Thread Collection has appeared all over Flickr, and two trailer-style videos have been made of the event (links at the end). The venue itself is to remain open until the end of the month, so those who didn't manage to make it there in the flesh, so to speak, have chance to see it for the first time, and audience members a second. I promise that it's worth it. I don't want a write a huge review here: it's already been done, and I find that often, after being in a show, it's difficult to write about it. Not because there's nothing to be said, but because there is so much to be said, and no real way to say it all. To speak only half of it would feel like a betrayal. What I want to do is write a summary here - a conclusion, if you will - that might go some way to explaining what this virtual performance was like to both SL and non-SL users alike. 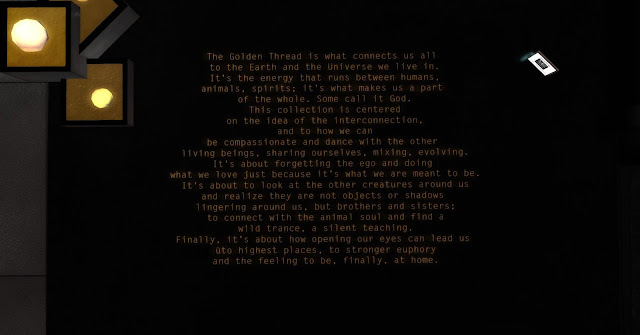 The Golden Thread is an avant-garde fashion collection released by MIAMAI under their BlackLabel. Instead of releasing the collection with a 'normal' fashion show, CEO Monica Outlander organised what can only be described, kind of lamely, as an art event. She commissioned work to be produced by four groups - two dance groups, one acting troupe, and then sian and I - and built a vehicle that would transport the audience members from one performance to another. All of four took place on individual stages within a (purpose-built) dark and winding forest. There were lights, music, a very gracious host to explain what was going on, and, of course, the clothes themselves. Everything worn by the performers and the models is being sold in the MIAMAI store, and the forest is also dotted with associated artwork, some of which is now for sale. Information about all of the performers has been put into notecards and made available to those who wander the venue. The sheer amount of work and effort that went into the creation of this concept and this production is insane. Knowing I wouldn't have too much to do during the performance itself, I set myself up to take lots of photos of the event. However, it didn't end up being that way, and as a result, I only managed to snap one quick picture of Kitti before the show began. For no reason I can fathom, Monica asked me if I could mind operating the vehicle the audience travelled about on (doesn't she know I am still having driving lessons?! :P) and that took all of my concentration. All of the pictures used in this post where taken after the event, at the venue. MIAMAI is, I think it's fair to say, a fashion giant if such a thing exists in SL. Mesh has come such a long way since I first blogged about it - and I was slow to the mesh party - but the new collection is just something else. The cut and texture of everything Monica has made are just incredible. You can genuinely almost reach out and feel them with your fingertips. My photos here don't do them justice. I can assure you that more will follow because I don't think I'm going to be wearing anything but the BlackLabel for a long time yet. This collection is a game-changer, I think, and it will be interesting to see if and how other fashion designers respond. What was so remarkably unremarkable was that, come the day of the performance, working on this show in SL became exactly like working on a show in the real world - in my experience, anyway. The day began with panic as someone was sick and a script needed finishing. Then nobody turned up to the dress rehearsal, and not everybody received the message containing the time we were requested to arrive at the venue to set up. During the final show (we performed three consecutive shows), we had technology troubles and our wonderful host was forced to improvise off-script and keep the audience happy for a full ten minutes at least whilst we got it up and running again. I was interested to see how performing in Second Life might differ from performing in real life, and honestly, I think it's pretty similar. Obviously, it was also completely different in a million ways, too. I could argue about physicality, and I didn't get the same kind of nervous shakes that I get every time I go on stage in real life. I could also talk about language barriers, and how this performance had much more of a global reach than anything IRL is likely to have without a physical tour. There is, too, the fact that I could leave my body standing on the stage beside sian, costumed and ready to perform, but have my screen focusing on the vehicle moving the audience around. I couldn't have been in two places at once IRL, although such a feat is often called for back-stage at a show on opening night. Let's not forget the danger with so many people occupying one small space that any one of us could have crashed at any time, effectively vanishing from the performance space and the entire world at any given point during the show. But for all intents and purposes, what happened and what went wrong and what went right and the general atmosphere was a very similar to my experiences of putting on a show in real life. And, as I have said, it appears to have been a great success. It was really fantastic to meet Monica, and then to meet so many of the MIAMAI staff and models, and meeting other performers, particularly those who are professional SL dancers - doesn't that raise a lot of questions?! -, is always interesting. And I only swore at someone once. That's probably a record for me...so maybe performing online isn't like performing IRL after all ;).